Weatherization - Typically a claimant/homeowner pays the entire abatement related cost and upon sufficient proof of payment and proof of product identification, i.e. that it is the Zonolite brand of vermiculite, can be reimbursed up to 55% of his costs. For example, if the abatement related cost are $7,500 and the claimant provides sufficient proof of payment of 45% of $7,500 ($3,375) the Trust can reimburse the claimant the remaining 55% percent or $4,125. The distribution procedures also allow the Trust to pay the contractor directly if authorized by the claimant. Proof of payment by the claimant of the applicable non- reimbursable portion of the cost of the abatement, i.e., the 45%, is required. 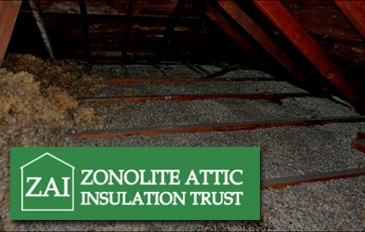 The Trust is aware that some homes that would otherwise qualify for certain weatherization subsidies are being deferred due to the presence of vermiculite in the attic. Unfortunately, this often presents a catch 22 for the homeowner as they cannot afford to pay their share of the abatement cost, i.e. the 45%. In cases where the weatherization agencies have funds available for vermiculite abatement, the Trust will allow the agency to stand in the shoes of the claimant and pay the contractor the non-reimbursable portion directly. Upon sufficient proof of that payment and a certificate of completion by the contractor, the Trust can then pay the contractor the remaining 55% of the cost. Please note there are caps on the amount that can be paid and evidentiary requirements that must be met. Please review the website in its entirety for more information.